It’s day 3 of Summer Fashion week at moms are for everyone! That means there’s more fashion here and the tour of Chattanooga, Tennessee continues. Our third stop is right across the Tennessee River on Chattanooga’s NorthShore. Littered with boutiques, locally owned restaurants and a pair of shoreline parks (Coolidge & Renaissance) the NorthShore is a gem. Coolidge Park plays host to TONS of fun, free entertainment during the summer months. Translation: we spend lots of time there. Moored on the park’s shore sits the Delta Queen. 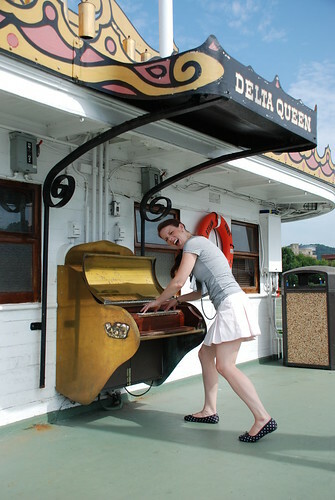 The Delta Queen was the last fully operational, overnight passenger steamboat in the country. Now, it serves as a boutique hotel AND a perfect spot for Summer Fashion Week photos. that I didn’t REALLY play. But the best part, in my opinion, is the view from the ship’s deck. It’s smack dab between the recently renovated Market Street Bridge (which you can drive across) and the Walnut Street bridge. The Walnut Street Bridge (it’s the one below) is one of the longest pedestrian bridges in the world. And is an absolute MUST photograph if you’re visiting us in Chattanooga – evidenced by this & this & I think you get the point. Please excuse my shyness and the fact that I HATE getting my picture taken. Obviously. Black Polka Dot Flats: Rugged Warehouse $3, baby!!!!!!!!!!!! Pink Pearl Stud Earrings: ?? Super Cool Black/Silver Bead Bracelet: Won in a Giveaway on Of Such is the Kingdom! 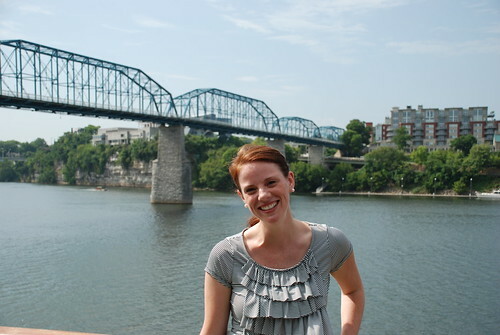 There’s the Walnut Street Bridge in the background… See what I mean about the views? Alrighty, it’s that time again. Head on over and check out all the other lovelies.